I’ve been meaning to talk about how cool the patterns are inside of security envelopes for a while now. I’ve been collecting them aimlessly for a few months now. Finally, I’ve been nudged into action with the opportunity to also talk about how cool Becky is too. Becky has a never-ending list of cool crafty-ness on her resume. 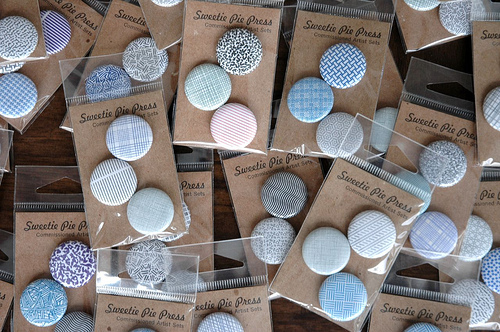 Her company, Sweetie Pie Press has been supplying the universe (literally) with sweet one inch buttons since the beginning of time. (or at least for many many years) She is also a part of and affiliated with City of Craft, Toronto Craft Alert and Church of Craft. Her craft influence is not just based here in Toronto. She’s currently wrapping up a North American tour of the craft fair circuit. It’s impressive and you can (and you should) read all about her adventures on her super entertaining blog. Back to the envelopes. Becky has hatched a plan for a massive art project that involves the collection of security envelopes from around the world. In exchange for any envelopes you might be willing to send to her, she will send you a set of security envelope buttons. What a deal! Read all about it here. 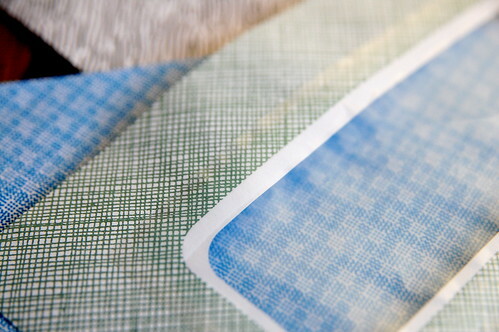 Also – Jill told me about Kristiina Lahde who makes cool art from security envelopes. There is treasure in to be found in that pile of pesky bills! I just tossed an envelope that I thought would make a cool desktop wallpaper. Off to see what other patterns I can find in the stack of mail. Aren’t these the best?! I’ve been cutting some up for paper embroidery projects, they are awesome! funny. I turn mine inside out and reuse them for letters. it’s a tiny bit of effort for a big pay off. charlotte – do they look much different? the envelopes, i mean, not the bills. i imagine the bills look just the same as ours – horrifying. rachel – speaking of wallpaper, i’d love to see it as wallpaper for a room! sarah – oh, paper embroidery sounds like lots of fun. do you do it by hand or on the sewing machine? willa – i’ve heard of that, but never tried it. it seem like the kind of thing that might take some practice. i will try it with today’s mail. I’ve been doing it by hand because I’ve been working on small pieces. It’s really fun! rest assured that i will be back in toronto and working on this project on the big workroom table before you can even take a breath.